As some of you might be aware in just under 3 weeks I will be undertaking a 107 mile run in 4 days across the Cotswold Way to raise money for Pancreatic Cancer! I'm excited to announce that we will also be hosting a live music night at the Crown Inn, Melton Mowbray on Saturday 28th April 2018 from 4:00pm until Midnight to raise money for Pancreatic Cancer Action and Birch Wood Special Needs School! We will be working in partnership with Birch Wood School to host this night! 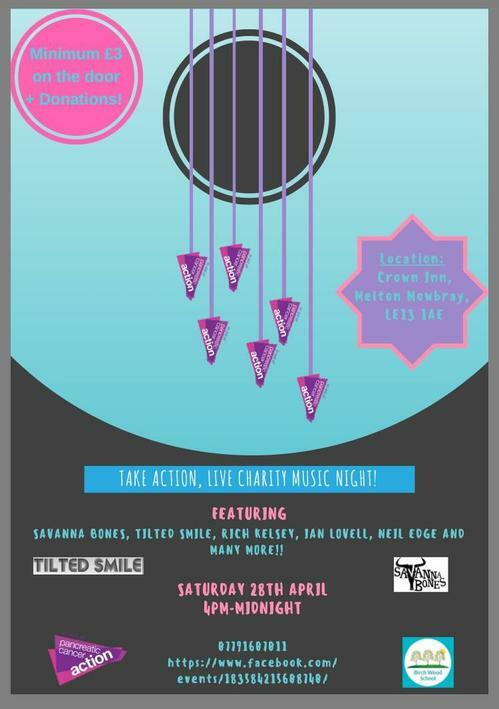 We have such an amazing night of Acoustic artists, Bands and DJ's, all to raise money for such amazing causes, to really make a difference to peoples lives! It's £3 minimum on the door for the event, but we invite you to pay as you feel appropriate in order to show your support the causes involved! We hope to see you all on Saturday 28th April!